Opera and Ballet spring season 2018. Open your eyes to beauty. Enjoy the best of classical ballet and contemporary dance as well as an enchanting ballet for the whole family, Moomin and the Magician’s Hat, all at one go. The Finnish National Ballet’s unique gala performance in Tampere Hall will see world class ballet dancers interpreting unforgettable classics. The gala programme will also feature Kenneth Greve’s hugely popular Moomin ballet in its entirety. This performance in Tampere Hall is guaranteed to end the spring season of the Finnish National Ballet in style. Great news for those who live in and around Oulu: The Finnish National Opera and Ballet will visit Oulu Theatre from 24 to 27 October, 2018. The guest performances include a family-friendly Moomin ballet, Iiro Rantala’s brand new opera Sanatorio Express, a once-in-a-lifetime ballet gala, and a children’s mini opera of Cinderella. Entrance is free to all the mini opera performances, which are supported by Ideapark Oulu and Arina Cooperative. Tickets for the other guest performances (Sanatorio Express, the ballet gala and the Moomin ballet) are sold at Oulu Theatre. On Thursday 25 October at 11:30 to 12:00 a discussion with the librettist of Sanatorio Express, Minna Lindgren at Arina Cooperative’s Shopping Centre Valkea. On Friday 26 October at 12:30 to 14:00 a Meet a Ballerina event at Ideapark Oulu. You can get an autograph, try costumes on and listen an interview (at 13:00 and 13:30). This new work by Iiro Rantala and Minna Lindgren is a hilarious take on the questions tormenting today’s humanity: how do I lose weight? How do I find peace of mind? How can I handle social media? Surely you can get over a divorce in a week? How do I deal with this shame? Loaded with self-deception, quacks and addictions, Sanatorio Express offers unorthodox answers and cures to everyday problems. Performances in Oulu Theatre on Wed 24 Oct at 7 pm and Thu 25 Oct at 1 pm. Moomin and the Magician’s Hat by Kenneth Greve and Tuomas Kantelinen, the duo behind several hit ballets, will pay a visit to Oulu in October 2018. The Moomin ballet for the whole family tells the familiar story about a mysterious magician’s hat. It has already charmed both Japan and Helsinki. Performances in the Main Stage of Oulu Theatre on Sat 27 Oct at 2 and 4 pm. The Finnish National Ballet will stage a unique performance at Oulu Theatre where unforgettable dance numbers will be interpreted by top dancers. The familiar story of Cinderella and her ugly sisters is presented in a hilariously updated 30-minute opera to the bubbling tunes of Rossini. A brisk and cheerful short opera suitable for everyone! Performances of Mini Opera: Cinderella are supported by Arina Cooperative and Ideapark Oulu. Local performances of our school opera Ihmepoika A [Wonder Boy A] are created jointly by schoolchildren and opera professionals. The opera was written by Karri Miettinen, also known as the rap artist Paleface, with music by Timo Hietala. The director is Riikka Oksanen, and the visual designer is Anna Kontek. The production was premiered in Almi Hall on 7 Apr 2017, after which it goes on tour to as many as 80 schools around Finland from autumn 2017. Ihmepoika A is the seventh school opera commissioned by the FNOB. Höstsonaten – Autumn Sonata is the meeting of a story by cinema legend Ingmar Bergman and the music of Sebastian Fagerlund, one of the most highly acclaimed Finnish composers of his generation. The opera, which drew sell-out audiences to the Finnish National Opera in the 2017–2018 season, will be performed as a concert version at the Baltic Sea Festival in Sweden next August. The Finnish National Ballet was on tour in Tokyo and Osaka in Japan in April 2017, with six performances at the Bunkamura Orchard Hall in Tokyo on 22–25 April and two performances in Osaka on 29–30 April. Nearly half of the members of the FNB were on the tour. 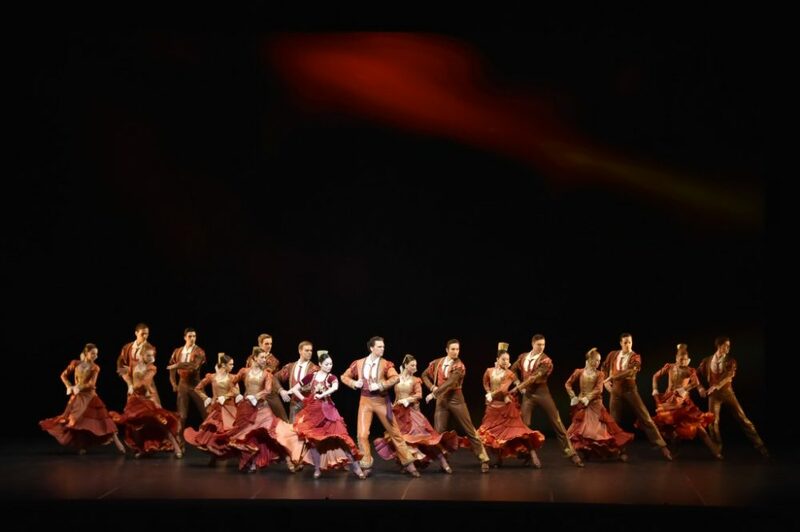 The programme included a gala performance featuring extracts from the FNB’s foremost productions, such as Swan of Tuonela by Imre Eck to music by Sibelius and scenes from Swan Lake, Don Quixote and Ballet Pathétique by Jorma Uotinen. The gala culminated with a Moomin ballet, Moomin and the Magician’s Hat, specifically designed for the Japan tour, based on Tove Jansson’s book Trollkarlens hatt (Finn Family Moomintroll). This new work is choreographed by Kenneth Greve to music by Tuomas Kantelinen. Finnair, a leading Nordic airline, was the Finnish National Ballet’s partner for the Japan tour. The tour forms part of the official celebrations for the centenary of Finland’s independence. The Finnish National Ballet visited Copenhagen, Denmark in January 2017, with four performances of the ballet The Snow Queen by Artistic Director Kenneth Greve at the Royal Danish Ballet between 27 and 29 January 2017. The visit by the FNB was one of the international top moments of the celebrations for the centenary of Finland’s independence. The Snow Queen has been a huge success in Helsinki, playing to sold-out houses, and it was only natural to take it to Copenhagen, since not only is it based on the story by Danish author Hans Christian Andersen, but Kenneth Greve is also Danish and a former principal dancer with the Royal Danish Ballet. Queen Margarethe of Denmark and Finland’s Prime Minister Juha Sipilä visited the premiere of The Snow Queen in Copenhagen. The Danish audience warmly welcomed the ballet. If you haven’t been able to see this smash hit ballet, you can watch it online in our Stage24. Kulturkupeen: Snedronningen – Den Finske Nationalballet på Det Kgl. Teater. So You Think You Can Muuv? is a series of high-energy workshops designed to inspire schoolchildren in 5th to 9th grades to dance and create choreographies of their own with professional dancers. Combining classical ballet and street dancing, this teamwork and performance workshop integrates dance seamlessly into the school day. So You Think You Can Muuv? workshops are held in the Helsinki Metropolitan Area and occasionally in other locations, too.